Still trying to find my bearings on Twitter, I scanned the Tweets of others in an attempt to learn the protocol of my new universe. One Tweet caught my attention. Anne Mitchell, @f_f_stories, tweeted her interest in the stories of maiden aunts and bachelor uncles. This shook a branch on my own tree. When I was still in the early days of fitting together my family puzzle pieces, I brought several mystery photos to a relative in Ishpeming, MI. I knew these photos were from our Cornish side, but in that strange way fate has of weaving us together, this relative not only shared Cornish ancestors with me, but we also were connected through our Swedish roots. Sitting in her kitchen that day, she opened one of those round cookie tins, the kind that took me back to my childhood where prying the cover open always revealed a homemade surprise. This cookie tin didn’t disappoint, Here Colleen stored her photos of old. 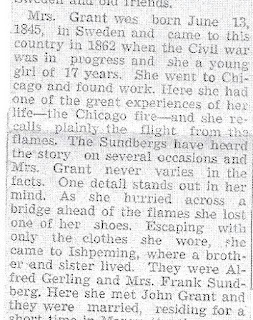 Pulling out a newspaper clipping from our local paper, The Mining Journal, she told me the story of Auntie Grant, my married but childless Swedish ancestor. Auntie Grant’s story was gripping. 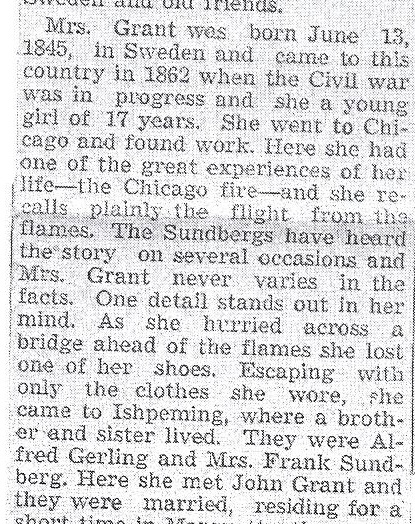 Not only had she lived to be 100 years old, but she had made a great escape from the Chicago Fire of 1871. It was an escape with a familiar, but this time, very real component. I was mesmerized. Who was this Auntie Grant and how was she related to me? Now, over two years later, I still can’t be sure of all the details of her life. Swedish records are difficult to read. Names and spellings were changed. Relatives’ recollections sometimes conflicted with the printed word. And most importantly, key records were destroyed in the Great Chicago Fire of 1871. But using Ancestry.com and dusting off the memories of the living, I know Auntie Mathilda Grant was my 2nd great grand aunt, a woman with no children or grandchildren to tell her story. I felt compelled to step in. Thanks to the sources available to me, and especially the story of her 100th birthday printed in The Mining Journal, I imagined that night in 1871, the one Auntie Grant relived and retold for the remainder of her years. Although the details below are of my mind, the key facts honor the remembrances of Mathilda Gerling Grant. Mathilda lived in one of those beautiful wooden mansions that nearly touched one another in the heart of Chicago. She often glided her hand along the intricate woodcarving of the rail as she floated down the grand stairs into the kitchen. She liked this waltz as it was one the few times when she could leave the drudgery of her world and let her imagination fly. In this world she wasn’t the twenty six year-old housemaid, the girl who made the beds upstairs and cleaned the furniture. In these few moments, she was a princess, with a string of pearls, a lacey dress, and high-topped shoes. But when her well-worn, brown shoe struck the plank of the landing, Mathilda was brought back to reality. “Mathilda, milk,” hollered the head cook. Mathilda knew this English word so she picked up her long skirt, creaked open the back door, and tiptoed through the dry grass spikes to the barn. She often envied the boys who spent their time tending to the cows and chickens in the slatted barn. At least they had a bit of outside air. Even though it was the first part of October, the weather had been so dry that the house was even more stifling and humid than usual. The night air was a welcome relief. The barn boy nodded and handed her a pail. He didn’t speak as it would have been useless. Like Mathilda, he only had a few words of English in his vocabulary. She tried to peek in and noticed the lantern and few tiny stones that afforded them a multitude of imaginative games. How she wished that she, too, could work in the barn. At least nightfall would bring time for something other than work. Mathilda handed the milk pail to the cook, but tried not to meet her eyes. She didn’t want to be pulled into the kitchen work. She turned around quickly and forced her feet to run silently up the back stairs to her tiny quarters off one of the daughter’s rooms. She could sleep tonight as the 14 year-old was not home to yell for help. The family was returning from their summer home along Lake Superior. Mathilda smiled. Her brother lived in Michigan. Perhaps they would be carrying a letter from him. Suddenly there was a chorus of voices. These were frightened yells! Mathilda ran to the landing. The window framed a strange picture. Men, boys, women, and girls were racing from the houses that lined the street. For a few seconds she nearly laughed as they streamed from the wooden shelters. Who knew this many people were hemmed into Chicago’s rows of wooden homes and businesses? But the colors that roared closer with each second slapped her back to reality. Brilliant orange and red swaths lit the black smoke that bellowed down the streets. “Come Mathilda,” screamed Cook. Mathilda didn’t hesitate. She raced down the stairs and into the streets. She was panting, afraid to turn and look at the flames she was sure were lapping at her back. Out of breath, she stumbled to the small bridge over the river; panic lighting every inch of her already exhausted body. As her feet hit the uneven planks, she nearly tripped. She lunged forward, heart racing, as she knew she would be trampled if she couldn’t catch herself. In the struggle to stay upright, Mathilda’s right shoe flew off. Her mind raced. This was her only pair of shoes. But the frightened voices, yelling in what seemed like a hundred different languages, spurred her on. As she ran forward toward the spikes of grass, she hopped a bit to allow her shoed left foot to land more forcefully on the ground. Rational thought gave way to the instinct as she joined the throng of the frightened. Mathilda ran and ran and ran. Eighty years later Mathilda had no clear memory of how she got to Michigan. In her mind, she just kept running….all the way from Chicago to her brother’s home. But her recall of those few moments during the Great Chicago Fire was always clear. She was the Cinderella of October 1871. She had escaped her life of servitude, leaving behind her shoe; and in true fairy tale fashion, lived happily ever after, to celebrate 100 years of age, when she shared this legend with those who gathered to hail this Cinderella Centenarian. Kathy, your newspaper clipping with the surname Grant, and your mention of the small Michigan town Ishpeming, caught my attention, but your wonderful writing style drew me in. I just love what you are doing here with your blog!